These top Christmas gifts for girls for 2012 appear on the Dream Toys list from the UK Toy Retailers Association and the British Toy and Hobby Association as released in October 2012. This year, the list is dominated by character-led toys such as Mickey Mouse, My Little Pony and Monster High. Back in January we predicted that one furry feline would be on the list - Cherry the Cat. In fact, she's on the Interactive Toys list, but we think she's purr-fect for any animal loving girl. 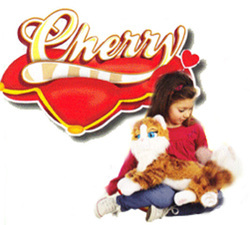 Cherry is the next generation intractive cuddly plush toys from Emotion Pets, the makers of 2011's highly successful Milky the Bunny. The demo model we saw at the London Toy Fair was beautifully made, with big blue eyes and soft fur, exactly what girls would love to snuggle up to. So, here are the top girls toys of 2012: red links go to dedicated top toys pages.